Thought of the day… "when is a weed not a weed?" Some people see them as the scourge of their flower bed, others as a natural and wild source of food and medicine but what exactly is a weed and are they really just a plant growing in the wrong place? There is no biological definition for a weed, the Concise Oxford English Dictionary’s definition is a wild plant growing where it is not wanted and in competition with cultivated plants. I like dabbling in the occasional harvesting of the wild for the purpose of food, drinks and even mild medicine. 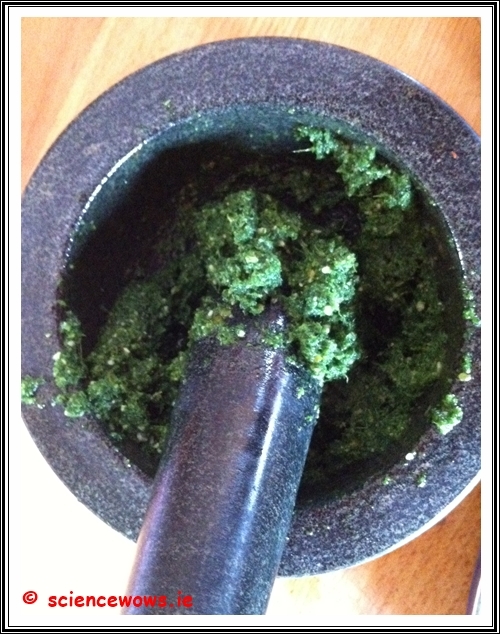 Last week we gathered some young nettles and made a delicious pesto! I have to admit I got a great kick out of gathering something growing wild in the garden and changing it into something tasty and nutritious! Nettles can be used very much like spinach but contain higher levels of trace elements and minerals. They are good for detoxifying and cleansing the blood as well as reducing many ailments associated with inflammation. Just on my doorstep (well almost) is the Corrib Lake, the second largest lake in Ireland. Unfortunately, certain parts of the lake are currently under invasion from a non-native species – the curly-leaved waterweed (Lagarosiphon major). This weed has become a real problem within the lake and has a negative impact on the population of brown trout for which the lake is renowned.I can’t deny I grumble about weeding, but overall I like plants that have a function other than just aesthetic pleasure and to me weeds often fall into this category. However, there is the flip side! Just as within the animal world, it is often not a good idea to introduce non-native species to a new environment! So which side of the fence do you sit on when it comes to defining weeds, or are you like me, jumping back and forward depending on the weed that’s in it?